Pros: This production fits any day, any mood and anyone and everyone. Cons: I honestly find it very hard to think of anything. Our verdict: One of the sweetest, most tender productions out there at the moment. Aimed at all kinds of audience, you will simply love it. A new production of the 1964 play by Pulitzer Prize-winner Paul Zindel, The Effect of Gamma Rays on Man-in-the-Moon Marigolds tells the story of a young girl, Matilda, aka ‘Tillie’. She is utterly in love with the far-away, dreamy world that science presents, which is so different from the harsh reality she shares with her dysfunctional mother, older sister Ruth and their pet rabbit Peter. Matilda, played by Evelyn Campbell is introverted and quiet, living constrained by the explosive and manic character of her mother, Beatrice ‘Betty’ (Sophie Doherty) and popular, giddy schoolgirl Ruth portrayed by Katherine Rodden. ‘Nanny’, an additional although somewhat unusual member of the family (Clare Almond) joins the family scene occasionally. Nanny is an old, frail woman under the care of Beatrice – she provides the family’s only economic income and although she is a silent character, she gives a way for the audience to see Beatrice’s scornful attitude towards all that surround her. In their little home in an American tow, Tillie fights to go to school and learn all about the fantastic, magical world of atoms. In this world, she is made of stardust, the sun and stars are glowing inside her and everything is pure and beautiful in comparison with the pernicious family environment she comes back to every day. But not only does she love science, she has a natural talent for it, much to the excitement of her tutors (and the dismay of her mother), and so is given an additional project to present to the school’s science fair; The Effect of Gamma Rays on Man-in-the-Moon Marigolds. The play develops in the family living room, decorated sparsely with the basics in a very modest fashion, showing their struggling way of life. The adjacent room belongs to Nanny, who very rarely wobbles out. By means of changes in lighting, the scenes switch from a well-illuminated family area to Tillie’s inner world, bathed in shadows where the audience is allowed to hear her thoughts. A single light bulb blinks weakly whilst Matilda’s voice resonates in the theatre: ‘a-toms‘. The plot and staging at the Brockley Jack Studio Theatre are truly inspired. But what stole the show completely were the sublime performances. Tillie barely has any lines and yet Campbell makes the character transparent and completely accessible as the shy, quiet and studious child. Rodden plays Ruth as impatient, childish and broken inside. She has seizures brought on by unpleasant thoughts or intense emotions, much of the time spurred on by her mother’s noxious remarks or actions. But the pièce de resistance was Sophie’s Doherty’s performance as the mother. 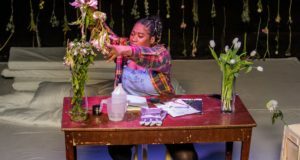 Her skills on stage gave the show the bewitching parallelism between Tillie’s love for science and her marigold experiment and the deteriorated family environment she creates for the girls. It gives the audience the chilling effect of seeing what happens when something beautiful and fragile is subjected to toxicity, much like the effects of gamma rays on marigolds. 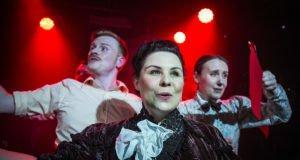 The most outstanding thing is that the character does not inspire aversion: Doherty places Beatrice’s fears and insecurities in the foreground, not only giving a terrific performance but also giving structure and basis to the whole show. This has to be one of the sweetest, most tender productions I have ever seen. I encourage everyone who reads this to go see it, you will leave the theatre in love with the experience. 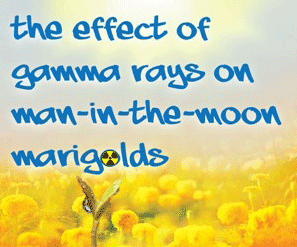 The Effect of Gamma Rays on Man-in-the-Moon Marigolds runs at Brockley Jack Studio Theatre from 1st October to 19th October 2013.